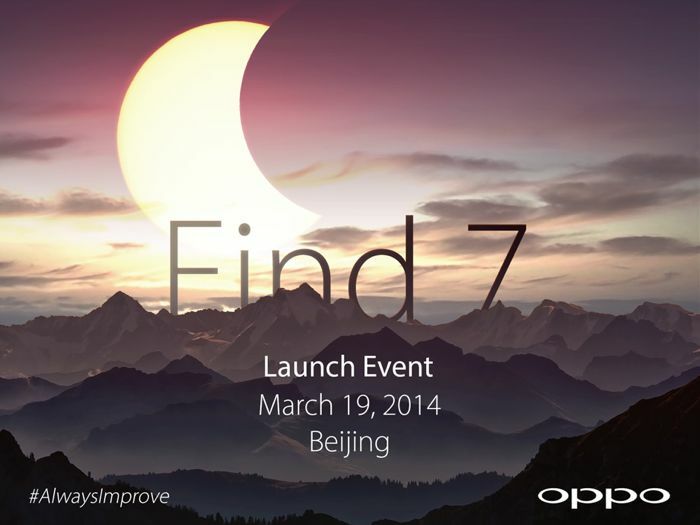 Yesterday we heard a rumor that the Oppo Find 7 would be announced on the 19th of March, and now Oppo has confirmed a press event for the launch of the Oppo Find 7 in Beijing on the 19th of March. Oppo has yet to reveal any specifications on the new Oppo Find 7, although we have heard a number of rumors about the handset over the last few months. The Oppo Find 7 is rumored to come with a quad core Qualcomm Snapdragon 805 processor with a clock sped of 2.5GHz, this is Qualcomm’s latest mobile processor and we are expecting to see other devices powered by this CPU announced at MWC later this month. The handset is also expected to feature a 5.7 inch display that will come with a QHD resolution of 250 x 1440 pixels, the device will apparently also feature 3GB of RAM. Other rumored specifications on the Oppo Find 7 include a choice of 16GB, 32GB and 64GB of built in storage and the device will come with front and rear facing cameras. On the front of the Oppo Find 7 will be a 5 megapixel camera for video chat, on the back of the handset there will be a 13 megapixel camera for photos and video. The device will also come with WiFi and Bluetooth 4.0 and will feature the latest version of Google’s Mobile OS, Android 4.4 KitKat.